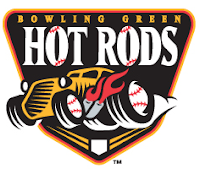 Bowling Green, KY – Jason McEachern worked a season-high 6.1 innings while Bennett Davis drove in three runs to lead the Hot Rods to a 5-3 series-opening win over the Lansing Lugnuts. The victory opens up a six-game home stand at Bowling Green Ballpark and improves the Hot Rods to 3-1 to begin the second half of the season. McEachern and Lansing starter Matt Fields threw matching zeros on the board through the first three innings, allowing just four combined hits. After McEachern threw a perfect fourth inning the Hot Rods got to Fields in the bottom half. The frame began with Tyler Bortnick belting his 22nd double of the season, moving him into second place in the Midwest League. He scored when Brett Nommensen followed with his own double to put the Hot Rods on top 1-0. After a walk and a fly out, Bennett Davis impressed the home crowd in his Bowling Green Ballpark debut by singling home Nommensen to make it 2-0. Kyle Spraker followed with a single to load the bases, giving Julio Cedeno the opportunity to make it 3-0 with his single into right field. Those three runs were all McEachern needed. He worked into and out of a bases loaded jam in the fifth before retiring the side in order in the sixth. He ended up leaving the game with one out in the seventh after surrendering a soft single to Kevin Ahrens. Deivis Mavarez came on and issued a walk before striking out the final two hitters to preserve McEachern’s shutout effort. McEachern allowed just four hits and a pair of walks to go along with four strikeouts to earn his third win in 2010. Lansing would eventually ruin the shutout completely by getting a pair of runs off of Scott Shuman in the eighth. The rally snapped Shuman’s 16 inning scoreless streak and cut the Hot Rods lead to 3-2. But Davis came through again in the bottom of the eighth, smacking a two-run single to bump the lead back to three runs. The Hot Rods would need those runs as Alex Koronis allowed a run in the ninth before settling down to strand a pair for his second save of the season. Davis was the offensive star for the Hot Rods, going 2-4 with a three RBI game. He also stole his first base of the season in the eighth inning. Mark Thomas added a pair of hits to extend his hitting streak to 10 games. All told the Hot Rods finished with 14 hits with every starter picking up at least one. The series continues on Tuesday night with another KRAFT ® Singles Tuesday. Fans that bring in a KRAFT ® wrapper receive a special Buy One Ticket, Get One Free offer courtesy of KRAFT ® Singles. For tickets, visit www.bghotrods.com, call 270.901.2121, or head to the Ticket Office at Bowling Green Ballpark. The pitching match-up for Tuesday night features RHP Kirby Yates (1-2, 1.93) going up against Lansing LHP Egan Smith (1-0, 3.00). First pitch is at 7:05 PM. You can listen to the game with Tom Gauthier and Hank Fuerst beginning at 6:50 on 1340 AM WBGN and www.bghotrods.com.